The activities build on children's natural interests and offer children the time and freedom to construct and reflect on maths ideas. teachers can use these step-by-step activities throughout the day, using mostly common, everyday materials. The authors describe how to address each of these maths key experiences when setting up the learning environment, planning the daily routine, and interacting with children. 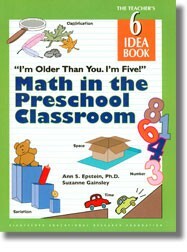 they also present a summary of the latest research on why and how to teach maths in the preschool years. If you think you have to be an Einstein to help young children learn maths concepts, this book will give you the tools and confidence you need to provide meaningful maths experiences for young children. Beginning, middle, and end--how to introduce and extend the maths concepts and bring the activity to a close.